It’s so interesting when you take a look at the investment world and you try and decide where you want to put your money. Now, I’m not just referring to stocks, bonds, or mutual funds. 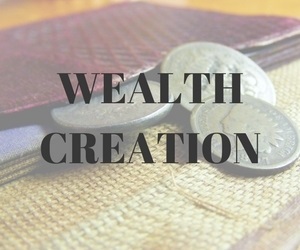 I think you could really look at two different ways to really create wealth. The first one is the slow but steady route, which is the traditional way and that’s saving every month, socking away some money, and slowly building your wealth over time. Perhaps, if you’re making a ton of dough, you can really do it significantly in a short period of time. Our friends that are surgeons that are making $300,000 $400,000 $500,000 or even $600,000 a year from their day gig as a physician certainly can save tons and tons and tons of money (minus the taxes of course). The other method is what I call wealth creation. There are so many different ways to go about that process. The one that I personally advocate is through equity that you build yourself in your own business. If you think about investing in general, there’s really two different categories that you invest in. Either you own something, meaning you have equity, or you loan someone else money, meaning a form of debt. I’ve seen plenty of people that have made money by loaning out money to folks that are elsewhere in the world and can’t get access to credit. In many cases, they are making 13%, 14%, or even 15% a year. However, there’s some risk that comes with that and certainly defaults can be much higher- meaning that sometimes the person you loaned money to can’t pay you anymore and the loan goes away. That’s bad news my friend. Often, there’s no collateral like a house or property to fall back on. When you lose it, you lose it all. I’ve seen other people create wealth in real estate by investing in rental homes, by investing in surgical centers, and by investing in their own practice. Personally, I have stayed away from real estate at this point. Although, I am gaining more and more interest in investing in land rather than rental homes. Anyhow, to this date, I have focused on acquiring and building businesses. In my financial planning business, I own it and I certainly have a good deal of equity in my business. Naturally, that’s not the only thing I am invested in. I also have money going the more traditional route. We save hundreds of dollars every month and sometimes we lump sum thousands of dollars via the traditional route and we’ve built up a nice portfolio. However, I got to this point recently where I really just want to jump-start my goals. I want to make more and more progress than what we are doing. In my previous blog post, Why I Won’t Retire By 45, my wife and I have made certain choices with our money. I’ve been really looking at a number of different things. 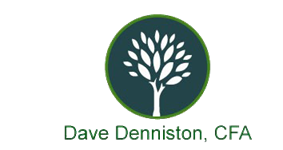 As I looked at my financial planning business acquisition, well… honestly… it didn’t work out the way that I wanted it to. If you measure it in terms of rate of return and what I’ve gotten, it’s been well over 10 percent. Despite the struggles, despite the agony of having gone through it, it’s provided a very nice rate of return of investment on the acquisition. Of course, we’ve been living off of most of that money, which certainly makes it not a true, true investment in the sense of saving the cash that you are receiving. Frankly, I was expecting closer to a 30% rate of return which would have allowed us to save tens of thousands of dollars every month. Needless to say, it didn’t turn out that way. As I’ve been evaluating myself and where I’m going and who I am and what I enjoy and what I’m passionate about, one of the mistakes that I see a lot of other people make is they blindly invest, when it comes to investing in private equity. Private equity means that it’s a private company that they invest in. It’s not publicly traded like Microsoft, Google, or the thousands of other companies you can find on the stock exchanges. The major mistake I’ve seen people make in private equity is that they’re not involved in the business. It’s truly a passive investment. They hand money over to the company just trusting that the process will work out and hoping that it will. The problem that I have with this concept is that this is an ILLIQUID investment and they’re not involved in the day-to-day operations of it. They can’t simply just liquidate the investment and move onto something else. Once they are in, they are locked in for good or for ill until the management team allows them to liquidate the investment. You are at their mercy. In my opinion, with these kinds of investments, you NEED to be involved in the day-to-day operations. The risk is simply too great. You need to be the management team so that you can decide when you want to sell it. As I look at myself and my situation, I don’t want to just blindly hand money over to someone else for their company. I would rather build my own. So, what should I invest in? Frankly, for myself, I have a mild interest in real estate. However, I’m not someone who’s a contractor. I’m not someone who knows a lot of people in the construction industry. Yes, I’m an Eagle Scout, and I have dozens of merit badges to prove it, but frankly I’m not really that good with my hands. Honestly… I really don’t enjoy handy stuff. What I do enjoy is businesses and evaluating businesses and finding ways to make them grow. 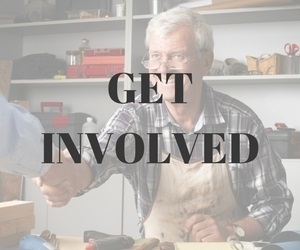 I have a passion for marketing as a way to serve and to give to others. I have a passion for coming up with new ideas and using my mind to try and think of new products and new ideas. I’m constantly wanting to do more. I set it down my iPad and go do something else and then came back a couple of days later. You see- they retargeted me with an ad that came up again, and I checked it out some more. They had a podcast, and I was listening to the podcast, which had really good content. I quickly found out that Empire Flippers is a business broker, meaning that they are an intermediary between people that buy and sell businesses. They don’t just buy and sell any kind of business. These are specifically online businesses across a variety of industries and interests. I was scrolling through, and I said, “Okay. You know what? I need to learn from my last mistake.” Obviously, I don’t want to go and invest $1 million again. 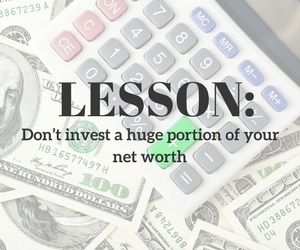 LESSON: Don’t invest a huge portion of your net worth. Thus, I was looking for investments that were under $100,000. I was surprised to find that there were a few different postings. We look over it and it looked legit. So, we went ahead and put down a deposit. Note: they require a 5 percent deposit just to start talking to the business owner once you’ve had a chance to review over the financials. Luckily, it’s a refundable deposit, so you can get your money back if you don’t want to proceed any further. You’re not locked in! Anyhow, we go and put a deposit to find out more about this business. On the business broker website, you can see a nice amount of detail. For example, you can see website traffic. You can see how much money they’ve made in revenue, as well as profit. By putting out the deposit, you can get full access to the financial statements and talk with the potential seller to ask lots and lots of question. A few days later, we set up a meeting with the caller. What was interesting about this gentleman, it turns out a lot of the content on this site was old. The last postings of content were from two and three years ago- nothing in the last six months! On top of that, there are no ads on the website. I was sitting there scratching my head and asking the question- how is this guy making money? Is this a scam? What have I gotten into? By the way, this is something that I don’t do. It is called affiliate marketing where someone pays you- the person who own an e-mail list to send out emails to certain parts of your subscribers. Needless to say, I’m not a big fan of that. According to the financials, this guy is making $50,000, $60,000, even $70,000 a year and he’s not doing a whole lot of work to do it. I liked the money and the profitability, but I didn’t like HOW he made money. I said, “For the right price, anything’s possible, but let me explore with my compliance desk to see what they have to say about it.” They flat out rejected it. 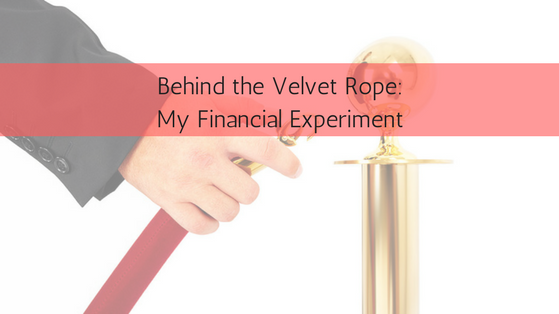 They said something to the effect, “You cannot do this because it is financially related where this business is pushing financial products.” You see… I’m in a very highly regulated business. In this case, the affiliates are trying to sell their Forex software to this e-mail list. That was an absolute no. That made my hemming and hawing an easy out. I was poking around. Having learned my lesson on what I can and can’t do via compliance, I found another website that was not financially related whatsoever where they specialize in themes for websites on this platform called WordPress. This was another business going for about $60,000 to $70,000. It wasn’t a ton of money and it was money that I could easily lose without worrying about it. Then, he starts looking through more websites. He found one that he was really excited about. He called me, and his voice was so excited, just stammering and the tone in his voice was infectious. There was just such joy pouring out of him about how excited he was for this opportunity. We end up looking into it and putting down a deposit to check it out. It turns out that this is a mobile game development software. And we’ve gotten to really be interested in it… so much so that we did buy it. 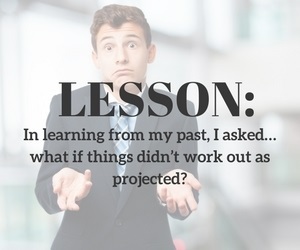 LESSON: In learning from my past, I asked… what if things didn’t work out as projected? I wanted to ensure that we are protected on the downside. I didn’t want to get into a position where the business wasn’t paying for itself. That was my caveat. I don’t want to do any extra money out of pocket. The business has to pay for itself. I don’t mind putting money down, but that can only be part of the purchase price. With the remainder, I didn’t want to do what’s called owner financing. This means that essentially you’re borrowing money from the owner and then it gets amortized- just like a car loan or a mortgage. You owe an exact amount of money each and every month. On top of that, the amortization schedule is usually very compressed- 1 year or 2 years. If things go south in a hurry, this investment could turn into a sinkhole where you constantly dump cash to pay the seller. As we started discussions with these folks, we suggested putting 50 percent down and 50 percent on a earnout basis. This means that you part with a good deal of cash, but only for part of the deal. The remainder comes from monthly payments are based on the performance of the businesses- usually a percentage of the revenue, gross profit, or net income. To give you an example, if you bought a business with revenues of $100,000 for a value of $200,000 and you were targeting 50% earn-out as I was and you want to spread it out over 4 years- your estimated earn-out of $100,000 (50% of $200K) would be 25% (25,000 divided by 100,000 of revenue). If in a bad year revenue was only $50,000 instead of $100,000, you would only pay $12,500. Thus, the seller is highly incentivized to keep the business moving in the right direction. I think my main lesson for you, my friends, as physicians, as you look at opportunities, whether they’re investment opportunities, whether they’re employment contracts, you have to be willing to walk away from the deal. You have to be willing to not get too emotionally tied to it. Learning from my mistakes, I know that that is my stopping point is where I’m going to have to put extra cash into a private investment. I have my own primary business to worry about. I don’t need a second one to worry about in case everything’s gone to hell and a handbasket. Fast forward two months later and we’ve now closed on the deal and about half of it is earn-out based just like I described. It’s been doing well, but worse than projected. Needless to say, I am very happy that we stuck to our guns on earn-out. How did I decide to finance this deal? For my portion of this money, I decided to do something I’ve never done before… use credit cards. I was inspired to do so by my good friend Amanda Liu (drwisemoney.com). She utilized zero percent interest rate credit cards to save tens of thousands, if not hundreds of thousands of dollars in interest on her student loans. I never even considered that until I met her a year ago. As I looked at this opportunity, I thought, “What if I used the bank’s money at almost no cost rather than my own money?” The thought was too tempting to pass up. It’s my experiment within my experiment. Initially, I tapped into my $50,000 business credit line at the bank in order to get the money immediately. This doesn’t come at a small cost. At the time, they charged nearly 7% and rising with rates. Yuck! I quickly got on the ball to explore my options. I checked out different credit cards at www.magnifymoney.com to find the best zero-percent interest rate credit cards. I didn’t find the unicorn credit card that met all these criteria. However, I did find one that met at least 3 of them… the Citi Simplicity Credit Card. It has a 20 month term of zero percent rate and no annual fees. Unfortunately, it did have a transfer balance fee. I put together a spreadsheet to show how the balance transfer fee would compare to my brand new shiny line of credit that I tapped. Above, the $12,500 was the Citi Simplicity card while the $20,000 remainder was the line of credit. As you can see, the annualized rate of the Citi Simplicity card totaled a whopping 1.8%. HUGE difference. 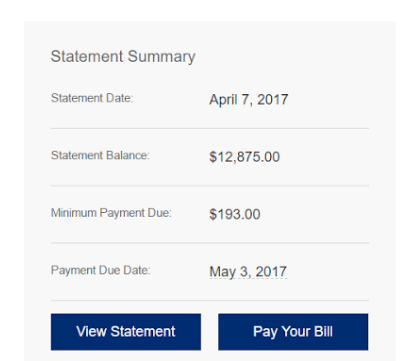 Needless to say, I immediately submitted my application and was immediately approved on 2/24/17 for the credit card for a credit line of $13,500. I then tried to get the cash moving. Unfortunately, I COULDN’T. I had to wait for the credit card. The process was very deceiving as Citi’s website was horribly clunky and not friendly to use at all. Finally, a bit over a week later, I receive my beautiful new zero percent credit card and I promptly submit a $12,500 dollar request from my brand new Citi Simplicity card on 3/3 to send to my bank account. Of course, they immediately charge the transfer balance fee and the $12,500 turned into $12,875. A screenshot is on the next page to check out. See how that puppy is pending? I checked day after day after day after day. A week goes by, they have not transferred the money yet. I’m starting to get nervous and I wonder if this was the right move. 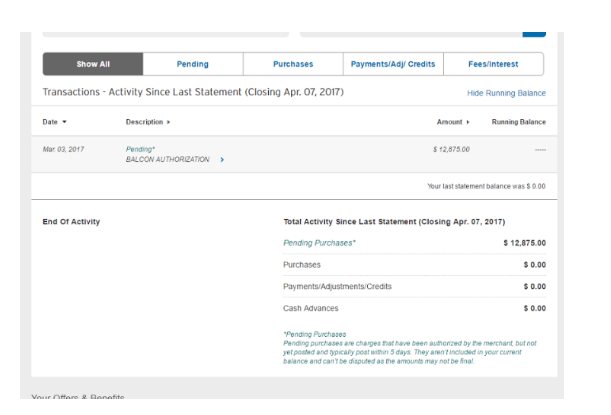 Another few days pass by and FINALLY as of 3/14/17, the funds from the credit company showed in my bank account which I immediately use to pay down the credit line. It took approximately 3 weeks from start to finish and cost me a couple hundred bucks in interest while I was waiting. LESSON: Give yourself 2 to 3 weeks of lead-time if you want to use zero percent credit cards. Subtract a month from their offer. I immediately followed Amanda’s suggestion and put a reminder in my calendar a month before the credit card is due to make sure that it is paid off. Some time passes by as I get my first bill from the business line of credit and the credit card. The business line of credit was close to $400 for the month and the credit card was close to $200. Between the two, I was looking at $600 per month in payments. For a business that should be paying me close to $1,000 per month in income, that gave me plenty of wiggle room. However, here we are now, 2 months into the process and I’m still sitting on the business line of credit. Due to the Fed raising rates, the 7% the bank was going to charge my business credit line has turned into 7.5%. Luckily, we have plenty of money in the bank and so I’m considering paying it all off. I have also considered taking out another 0% interest credit card, but because I’ve never done this before- I’m still slightly skeptical. Thus, I’m strongly leaning towards paying the approximate $20k remaining on the credit line. And so my friends… those are my experiments. I am going to do more and more of them over the next few years. I would just love to know from you as you look at investing outside of the box. What are you doing? What are you thinking about? Would you consider something like these different website businesses? I named a few. Obviously, there’s a ton more. There could be some medically oriented. There are some that are sports oriented, some that are entertainment oriented, some that are Fulfillment by Amazon, and all kinds of other different businesses. I would love to learn more of your lessons and what has worked and what hasn’t worked so we can pass it onto other doctors.